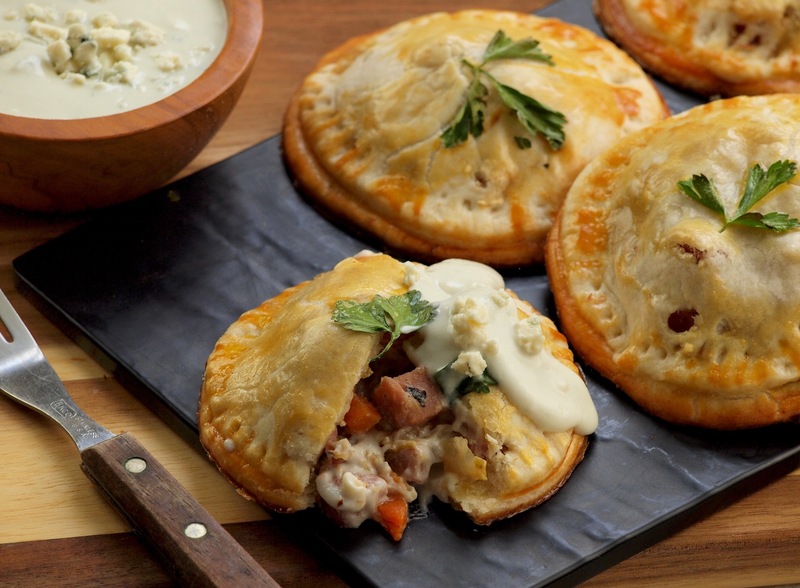 This twist on the popular ham and cabbage dish packs these mini pies full of flavor — cabbage, bacon, potatoes, and apples and then serves with a blue cheese sauce. These pies make a delicious quick weekday dinner or lunch, and a great celebratory dish to enjoy during St. Patrick’s Day paired with a pint! Preheat the oven to 350°F. Thoroughly spray 2; 12-cup standard muffin tins with cooking oil. Melt 2 tablespoons of butter in a large, deep frying pan, add the onion, carrot, salt, and pepper, and sauté on medium-high heat for 10 minutes or until softened and slightly caramelized. Stir in the cabbage, potato, and apple. Turn up the heat and cook on high until the cabbage starts to wilt, about 8 minutes. Add the Canadian bacon, vegetable stock, and mustard powder, and cook for four minutes until the stock is boiling and reduced by half. Stir in the Frigo® Whole Milk Ricotta Cheese and 2 tablespoons flour. Stir until thoroughly incorporated and there is no trace of flour. Turn off the heat and leave on the burner until ready to assemble hand pies. Whisk the egg in a small bowl, add about 1 tablespoon water, and set aside. Add ¼-cup filling into each little cup. Then, use a pastry brush to brush egg yolk around the edge of the dough. Place the lid circles on top of each cup. Carefully press the lids into the bottom crusts with your fingertips and then crimp the outer edge of the lid together with a fork to secure the outer edge. Lightly brush each pie with egg wash. Find the most attractive leaves of 3-leafed parsley. Set atop the pie and coat with a little more egg wash.
Bake until golden brown, about 25 minutes. Repeat with the remaining dough and filling. Meanwhile, make the blue cheese sauce by melting 1 tablespoon butter in a medium saucepan and add in flour while stirring constantly. Cook for 2 minutes over medium-high heat or until it just starts to get a bit golden in color. Slowly add milk while stirring. After the milk is added, cook until you see it thickening and then add the Frigo® Whole Milk Ricotta Cheese. Stir until mixture starts to thicken, add the Frigo® Crumbled Blue Cheese and Sherry wine, and stir until fully melted and well blended. Rad Remix: If you do not have muffin tins, another option is to cut out 18 (4-inch) circular discs for bases and 18 (4-inch) discs for the lids. (Use pastry cutters or a bowl as your template.) Instead of filling muffin tins, lay out the bases on a parchment-lined baking sheet tray, place filling on top of the bottom disk. Then use a pastry brush to brush egg yolk around the edge of the dough. Place the lid circles on top of each filled bottom disk and carefully crimp the outer edge of the lid together with a fork to secure the outer edge. Lightly brush each pie with egg wash. Find the most attractive leaves of 3-leafed parsley. Set atop the pie and coat with a little more egg wash.
Fresh Idea: For a vegetarian version, substitute bacon for mushrooms and vegetarian meat crumbles.